Octopus City Blues - The authentic Octopus City simulation for Windows, OS X and Linux. A surreal adventure game about everything and nothing. They are seeking $7,000 on kickstarter and have already blown past it to over $19,000 so it's another game in the bag for Linux! I like this game's focus on each and every individual NPC, the detail should be very nice for adventure fans. Paying $10 gets you a copy of the game so it's quite a cheap deal here. Ghost in a Bottle GmbH is pleased to announce Octopus City Blues, the authentic Octopus City simulation. 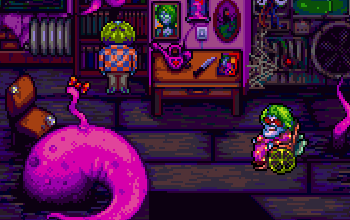 For people unacquainted with Octopus City simulation genre, the simulation resembles the adventure games of yore, immersing players in a fascinating setting filled with unusual characters. We place special emphasis on exploration, replay value and the consequences of choices. Assume the role of Kaf Kafkaryan, a cowardly middle-aged octopus blood junkie and tentacle trimmer, living in a city built around a giant octopus. Kaf has been experiencing bizarre dreams about a world populated by twisted creatures. To help the inhabitants of his dreams, he must learn more about the people of the city and explore the underside of the towering metropolis. Along the way he becomes entangled in a conspiracy with far-reaching implications for Octopus City. I saw this game in Kickstarter, totally crazy, I like the art style.